The universe aligns for me when I am exposed to that fatal combination of sweetness and saltiness. Throw in butter, and it becomes something far better than the sum of its parts, achieving a richness of universal proportions. 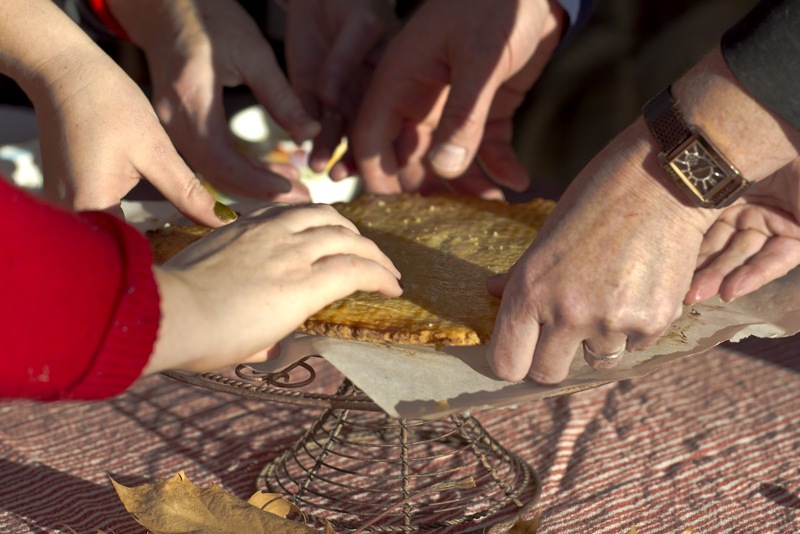 In western France, we first come across the fun but oddly informal tradition of guests reaching into the middle of the dining table and breaking off fat chunks of this sweet and salty, buttery biscuit which is brought to the table in the form of a large, golden slab. In the Normandy and Brittany regions, butter is king and remains an integral patisserie ingredient. The high quality, unsalted butter used in this recipe is the catalyst that creates the texture, and releases the fine flavour and irresistible smell of the biscuit while baking. It makes a huge difference to the finished taste, and this is one of those instances where price does count, so buy the best butter you can afford. 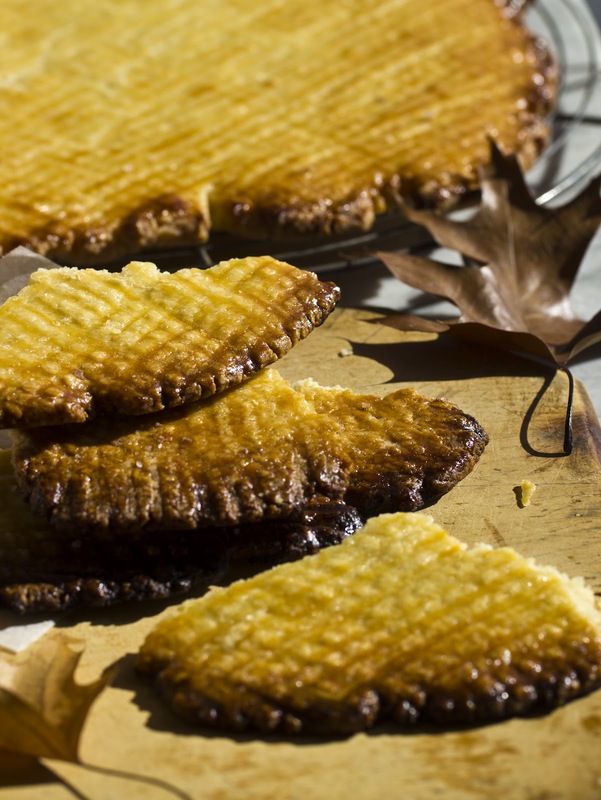 These traditional Breton biscuits date back to the 1800s and are instantly recognisable by the criss-cross pattern on the top, made shiny by painting liberally with an egg wash before they go into the oven. This large cookie is no exception and takes the shape of whatever large biscuit slide or pan you might have available. I usually make mine in a rectangular oven tray. This substantial biscuit has all the punch it needs to be served alongside a strong, black coffee. You can make this biscuit dough a few days ahead and store wrapped in cling wrap in the refrigerator or freeze in an airtight container. This dough quantity makes enough to cover a large baking tray. A timely warning at this point though. These need to be eaten in moderation as they are seriously addictive and probably don’t form part of any nutritionally appropriate diet. But we don’t indulge that often, do we? Place the flour, sugar and salt in a food processor and blend to combine. Gradually drop in the cubes of butter until the mixture looks like rough breadcrumbs. With the machine still running, gradually add the cold water, just enough to produce a dough that forms a ball. The dough should feel soft. Place the dough onto a lightly floured work surface, form into a flattened square and cover with cling film and refrigerate to rest for an hour or so. The dough can be left refrigerated for a few days at this point. When you’re ready to bake the dough, preheat the oven to 180C and line a baking sheet with baking paper. Remove the dough from the fridge to allow it to soften just enough to be malleable. Roll the dough out between 2 layers of cling wrap or baking paper and roll into a rectangle about 5mm in thickness. Roll to fit your baking tray. With a spatula, lift the dough onto the lined baking tray. Beat the egg yolks together with a teaspoon of cold water and using a pastry brush, paint the surface of the dough. With a fork or a sharp knife, score the surface into a criss-cross pattern, by first making lines one way, then the other. Sprinkle the surface of the dough with the extra sea salt flakes. Bake the biscuit for about 30 minutes, checking its edges do not burn. If you feel they are browning too much, cover the edges of the biscuit with a strip of alfoil to protect them while the centre of the biscuit continues to brown. The biscuit should be a shiny golden brown. Transfer carefully onto a wire rack to cool to room temperature and serve in the centre of the table to allow guests to break off pieces when they want. It’s that time of year when glazed-eyed cycling fans are glued to late night telly watching sweaty fellas on two wheels toughing it out through the impossibly picturesque and often steep French countryside, competing in the Tour de France. For those of us who are non-cyclists, don’t despair. 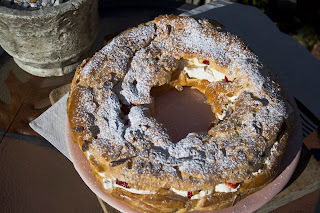 You can get into the quintessentially French spirit of this event by providing tempting sustenance to those devotees of the be-spoked wheel, in the form a Paris Brest. 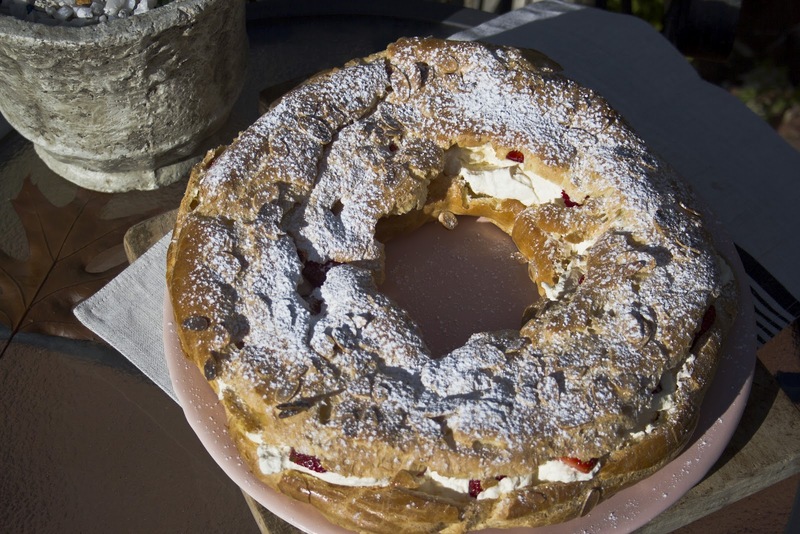 The traditional Paris-Brest is a bicycle wheel shaped choux pastry creation, filled with patisserie cream and topped with almonds and icing sugar. It was originally created in 1891 in honour of the Paris to Brest bicycle race, by a pastry cook whose shop was situated along the route. This spare wheel was filled with high calorie cream to provide sustenance to the race participants. 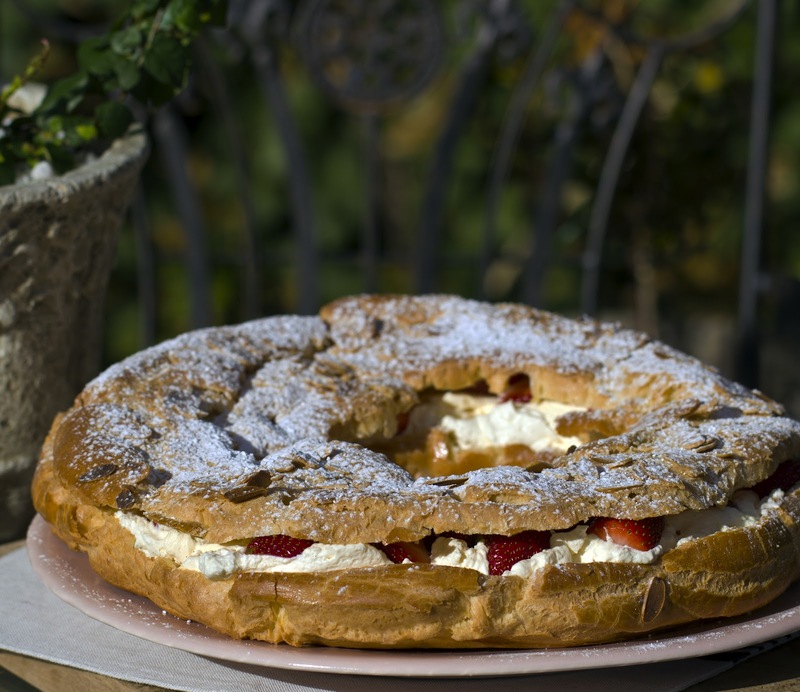 The patisserie cream filling can be substituted with fresh whipped cream and strawberries, which is a lot less work and much more economical. It also gives a lighter and fresher result. You will need a large pastry bag, with a wide nozzle about 18mm wide and strong arms to mix in the eggs. Alternatively, you could use an electric mixer with a dough beater, to mix in the flour and eggs, being careful not to over-mix the paste. I still prefer to do the mixing with a wooden spoon, this little bit of exercise eases my guilt before indulging. For flavour variations, add a few drops of liqueur to the cream, such as, Frangelico or Kahlua. If chocolate is more your thing, you could drizzle the top with melted chocolate, then decorate with toasted almonds. This popular dessert is found in good patisseries all over the world, but is an easy and impressive one to make at home. It’s a standout sweet that will provide calorific encouragement while watching the famous race and guaranteed to cheer on celebrations at your Tour de France parties. The quantity makes a 23cm round pastry that can be sliced into six to eight portions. Preheat the oven to 200C. Draw a 20 centimetre circle on the back of a piece of baking paper in a dark pen so that the circle shows through onto the other side. Using a baking tray that will take the size of the paper. Spray a few dots of oil onto a baking tray to help the paper stay in place. Place the paper on the baking tray, pen side down. Melt the butter with 375ml of water in a saucepan, then bring it to a rolling boil. Transfer the saucepan to a heat-proof work surface, such as a silicone mat. This will provide a non-slip surface for mixing the paste. Add the flour all at once to the butter and water mixture in the saucepan. Add the pinch of salt. Return to the heat and beat continuously with a wooden spoon to make a smooth shiny paste that comes away from the sides of the pan. Once it does this, remove from the heat and cool for a few moments. Beat in the eggs one at a time until shiny and smooth, the mixture should drop off the spoon, but not be too runny. Beat in the sugar. Standing the pastry bag in a tall jug, open the top up and fold it back, filling the pastry bag with the paste. Pipe a pastry ring over the circle guide you have drawn. Now pipe another ring of pastry directly inside this one so that you have one thick ring. Pipe another two circles on top of the first tow and continue until all the choux pastry has been used. Brush the choux ring with the beaten egg and sprinkle with the flaked almonds. Bake the choux ring for20 minutes, then reduce the oven to 180C and bake for a further fifteen to twenty minutes. Remove from the baking tray and place on a wire rack. Immediately slice the ring in half horizontally, using a serrated bread knife. Make the base twice as deep as the top. Lift off the top and scoop out any uncooked pastry from the base. Leave to cool completely. Whip the cream, vanilla and sugar until very stiff. Fill the pastry base with the cream and top with sliced strawberries. Cover with the pastry top and dust with icing sugar. What springs to mind when you hear the crack of a spoon against the golden, brittle surface of a creme brulee? For me, it’s Amelie, from the iconic French movie, where she plays a waitress who delights in cracking the toffee of creme brulee with a small spoon. Creme brulee is one of those dishes that consistently delivers eating pleasure. As a true fanatic, when I sit down to this dessert, like Amelie, it’s to the exclusion of everything else. What if the house was burning down, or there was a medical emergency? It’s all fine with my world, I’m eating my creme brulee. The voluptuousness of this refined classic, lies in the silkiness of the custard and is difficult to match in the comfort stakes, which makes it a perfect winter sweet. I’m pretty fussy about the temperature of my food, and I believe the flavour of this dessert is enhanced when it’s eaten at room temperature or just warmed. 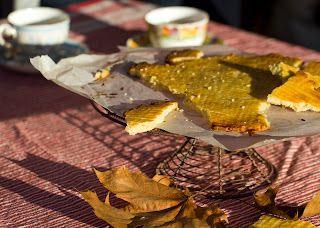 This means that when the toffee is cracked with the tap of a spoon, the custard oozes out through the cracks. It’s probably timely to mention the whole ‘enhancement’ thing here. It seems that creamy and unctuous is not enough, because many chefs seem to insist on adding nuts, fruit and even oats to creme brulee’s on their menus. 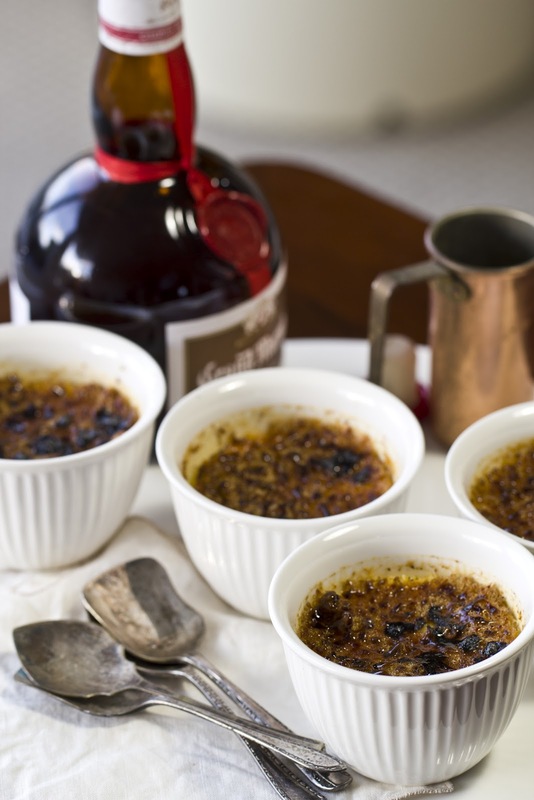 The traditional brulee is a simple cooked cream and egg custard that doesn’t need the bells and whistles of foreign bodies. Its perfection lies in its simplicity. Although, ever a creme brulee traditionalist, when eating out recently, the French waiter delivered the ubiquitous dessert to our table with a flourish, and recommended for ultimate perfection, to drizzle a little Grand Marnier over the cracked toffee. Shock, horror, he was right. Preheat the oven to 150C. Heat the cream and sugar in a saucepan and bring to the boil. Add the whole vanilla pod and vanilla seeds, then lower the heat and simmer gently for five minutes. Remove the vanilla pod and discard. Place a tea towel or silicone mat on a work surface and place a large heatproof bowl on it. Place the egg yolks into the bowl and whisk by hand until pale and creamy. Bring the cream back to boiling point, then pour a thin stream of about half a cup into the egg mixture, whisking all the time. This will loosen the yolks and allow them to accept the hot cream without curdling. Gradually add the remainder of the cream, whisking continuously. Strain the custard mixture through a fine sieve into a large jug for pouring. Fill six ovenproof ramekins to about two thirds full with the custard. Place the ramekins in a large roasting tray and carefully pour in enough hot water to come halfway up the sides of the ramekins. Place on the centre shelf of the preheated oven and bake for about twenty to thirty minutes. The custards are done when just wobbly in the middle. They will continue to cook slightly when taken out. Remove each ramekin from the roasting tray and allow to cool to room temperature. When cooled, you can cover them with cling wrap until just before serving or stored in the refrigerator for later use. When ready to serve, pre-heat the grill to very hot. Sprinkle one teaspoon of caster sugar evenly over the surface of each custard. Tipping slightly to ensure even coverage. Place the custards, a few at the time, under the grill, until bubbling and dark golden. Be very watchful, and stay with them to see that they don’t burn. They should be a dark brown. Leave to set and harden before eating. If you own a mini blowtorch for scorching the sugar, hold the flame about twenty centimetres from the custard surface and only for a few seconds, moving it around. The sugar will continue cooking after you take it away from the flame. Serve immediately. Like the waiter said, if you want even greater perfection, try adding a tablespoon of Grand Marnier drizzled into the cracked toffee. Again, winter hits with the subtlety of a sledge-hammer. I don’t know why I’m surprised, because it happens most years. With the end of the warmth, goes my need for fresh and light salads. My tastebuds crave something just a little more substantial, but not the full winter stodge, well not yet anyway. It’s time to celebrate what’s left in my garden to eat. I do have some winter vegetables planted now, and I am pretty excited about the prospect of cooking some broad bean dishes. So, with what’s left of the summer harvest, I now have in my basket, eggplants, rocquet, heirloom tomatoes and thyme. It’s the first time I’ve grown eggplant, and I was surprised at the time it took for it to grow, but not as surprised as being a victim of the spikes protruding from their stalks. As cool as it is to ‘grow your own’, my bloody finger is testament to the hardships of the grow what you eat philosophy. The upkeep and maintenance of a vegetable garden is not all roses, and the commitment it takes, is not to be sneezed at, well that is, if you don’t’ suffer from allergies. The flavour of eggplant is muted and musky and it just begs for tasty additions to pick it up. There is also something oddly comforting about the texture of cooked eggplant, it becomes soft and floppy and melts in the mouth. At the last step, pouring over the umamied oven juices, shoots the flavour up the scale. I love that word. Finally, we’ve found a description for it, rather than Nigella’s lusciousness and Jamie’s deliciousness. This combination of eggplant, tomato and lemon juice is still light enough for the early onset winter time of year, but the cooking of the eggplant provides a meatiness that gives substance to the dish. I put this as a side dish with some fillet steak, providing some blokieness to the dish. But sure, you could happily put this with chicken, or as a stand alone meatless meal and crusty bread, perfect as a vegetarian lunch. Preheat the oven to 180C. Place eggplants in an oiled baking dish, in a single layer with the cut side up. 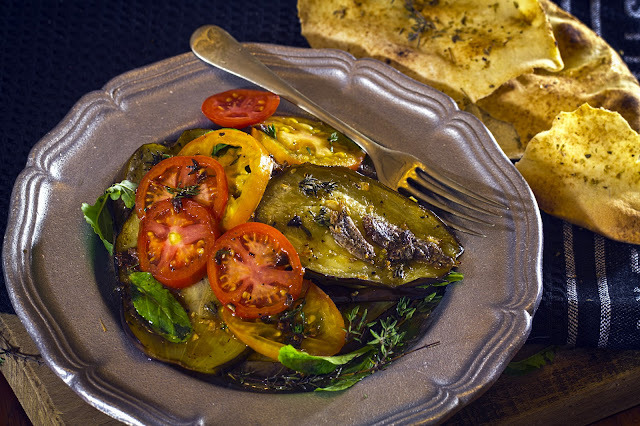 Drizzle with the olive oil, scatter the garlic, anchovies, thyme sprigs and salt over the eggplant slices and roast for about 15 to 20 minutes or until lightly browned and softened. Remove eggplants and arrange on a serving dish with the rocquet and place the sliced tomatoes on top. Add the lemon juice and extra olive oil to the baking dish. Return to the oven for five minutes until the juices are hot. Scrape the bottom of the dish to release all the cooked on flavours and mix together. Drizzle the juices over the eggplant and tomatoes, sprinkle with cracked pepper and serve. First published Canberra Times 6 June 2012. A visit to our local Alsace village farmers market expresses perfectly the French immersion and dedication to all things food. Artisans lovingly share the provenance of their produce, bringing a real sense of accomplishment and enjoyment in the simplest of foods. This is mostly inspired through the intensity of flavour and the raw, earthy charm of dirt-smothered roots and unwaxed fruit and vegetables on display. There’s lots to love, even while waiting for long periods at the more popular market stalls in the cold weather, listening to the fresh weekly gossip and sage advice from Madame. Ever a Francophile, that same sense of appeal arises for me, while foraging in our local farmers market and chatting with the stallholders who are passionate about their products. I want to know what I am eating, and that opportunity to learn of the provenance of the produce, influences the experience of cooking and eating the food I buy. On a recent excursion to our local markets, I chat to my favourite poultry supplier and I am drawn to the red, small but plump duck breasts languishing alongside the marylands. He holds them up to show me the thick layer of fat under the skin, a quality revered by the French. He explains they are free range, organic and freshly butchered. Although I hadn’t planned to cook any more figs this year, I still have a few late harvest globes dangling from my forlorn looking tree. I am lured towards a port and fig sauce to match these beautiful breasts. It’s a tasty cold night bistro style meal that will provide an excuse to knock the top off the lush 2004 Yarra Valley pinot that’s been waiting for this moment. These days, I consider duck breasts to be a fast food, as they can be cooked in under 15 minutes from start to finish and they play perfectly well with any number of sweet and sour sauces that contain fruit, honey and vinegars. The other advantage is that you can easily slip in fruits available through the seasons, such as berries, figs and stone fruits. Thin slices of peeled apple also work well in this sauce. The sauce can be made in advance, leaving it in the pan on the side of the stove ready to reheat and adding the fruit last, when the duck breasts are done. If cooking for more people, adjust the quantities accordingly. This is a rich dish, so you will not need large portions. 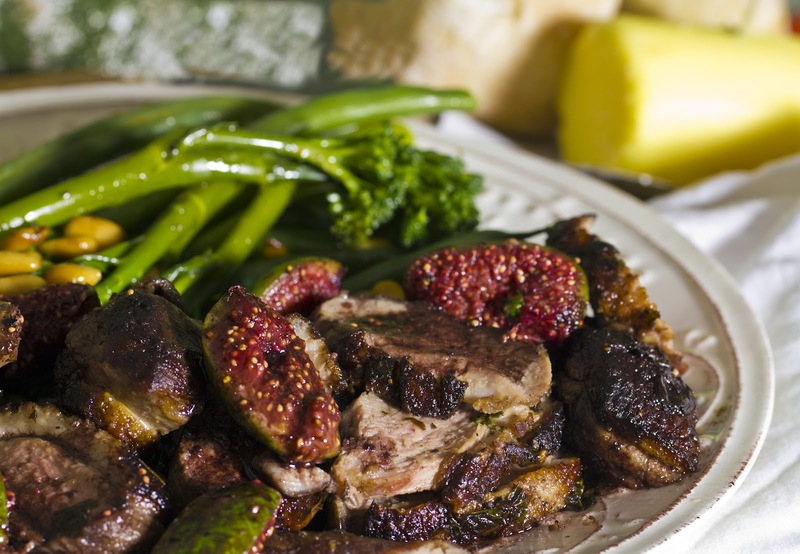 Serve with green vegetables in season with a burnt butter and pinenut sauce. Using a sharp knife, score the skin of each duck breast in a crosshatch pattern, taking care not to cut the flesh of the duck. Heat a pan with high sides, (something like a casserole pot to contain the spatters) and pour in the olive oil. When the oil is very hot, place the breasts in gently, skin side down and cook for seven minutes, or until the skin is very brown and crisp. Turn the breasts over and cook for a further three minutes for rare, or five minutes for well done. A lot of flavour is lost by overcooking duck. Lift the breasts out of the pot and onto a sheet of aluminium foil. Fold the foil loosely over the breasts to seal and place them in the oven on a baking sheet for five minutes to finish cooking. Pour off the excess fat from the pot and heat over medium heat. Toss in the garlic, thyme and star anise and stir. Cook for five minutes. Add the figs and heat for two minutes, stirring gently to not damage the figs. Remove the contents to a bowl and set aside. Remove the star anise and thyme sprig and toss away. Add the honey to the same pot and heat until melted. Pour in the port and vinegars and bring to a boil. Season with salt and pepper, lower the heat and using a whisk, gently stir in the butter in small pieces, until the sauce is glossy and smooth. Remove the foil packet from the oven and pour the juices from the duck breasts into the sauce. Then add the figs to the sauce. Mix together gently to reheat for about 30 seconds. Slice each breast into slices and serve drizzled with the fig sauce. Serve with seasonal vegetables and crusty bread. Heat an additional two tablespoons of unsalted butter in a saucepan on high. Add one tabelspoon of pinenuts or almond slivers and cook until dark golden brown. To serve, spoon over seasonal vegetables. First published Canberra Times 18 July 2012. As a kid, back in the 1960s, family midweek meals were always a bit of a drag. They really did interrupt the time we were meant to be doing other things, like watching the Flintstones, Bandstand or playing or listening to our Bakelite record collection of old songs. These records, were old forty-fives, that my sisters and I would make up dances to, while Mum and Dad sat patiently cheering and clapping at our un-balletic and awkward attempts at dance. We thought we were pretty special because we had a portable record player. It was contained in a small white-flecked suitcase, that resembled a beauty case from a sixties American sitcom. Meal-time in our house was catch up time, and Mum and Dad would ask how school was and what did we do. Really the answer was always the same, not much and boring. I can recall fidgeting on my chair just wanting the whole meal-time thing to finish, so I could get back to the important things, like drawing, television or reading. We had a pretty unique Mum compared to our friends in those days. She cooked different foods that originated from her heritage. But now and then she cooked something Aussie that would cause Dad to go into raptures and reminisce about his own mothers cooking. I think Mum did that to please Dad, and I can remember thinking how dead-boring the traditional Irish Aussie food was. One of those meals was Shepherds Pie or Cottage Pie. Dad would eat his dinner enthusiastically, and the only bit to me that was exciting was the crunchy golden potato top, sprinkled with buttery breadcrumbs. Why did I always get so little of the crunchy top and so much of the meat and vegetables? Mum had her own version of this dish, and my recall is of her chopping up the left over leg of lamb into cubes and cooking it up with a tomato based sauce. To that she would add vegetables, whatever was in season, then top the casserole pot with a thick layer of mashed potato. The potato layer was then made crunchy by creating a wavy pattern with a fork, sprinkled with breadcrumbs and then dotted with butter before cooking in the oven on a high heat. Jumping from the 1960s to now, my take on this classic replaces the lamb with flavoursome beef cheeks, slow-cooked in red wine for a few hours with a selection of winter vegetables. When the meat is melting, it is then topped with a layer of rich, creamy mash potato and baked in the oven. The slow cooking of the beef cheeks breaks down the sinewy meat, providing a rich, sticky melt in the mouth texture, and in my view, wins hands down for the ultimate winter comfort food. When cooking this dish, one of my greatest pleasures is peeling the dirty potatoes. There is something satisfying about washing the dirty potatoes, the very dirt they were grown in from the skins. I believe that dirty potatoes always taste better, at least better than the insipid pre-washed ones. To serve, pair the pie with winter beans tossed in freshly grated nutmeg and shaken with a knob of butter. Preheat the oven to 150C or get your slow cooker ready. Heat the olive oil in a large frying pan over a medium heat. Add the chorizo, celery, onions, garlic and carrots. Fry for 10 minutes until the vegetables are softened but not brown. Remove the chorizo and vegetables from the pan and place into a large casserole pot. Heat the same frying pan over a high heat, adding more olive oil if necessary. Toss the chunks of beef in the seasoned flour then brown all over, in batches. Add to the chorizo, celery, onions, garlic and carrots in your casserole pot. Pour the red wine into the frying pan, scraping off the sediment cooked onto the base from the floured meat and bring to the boil. Pour into the casserole, with the bay leaves, thyme and enough stock to cover the meat. Season well, bring to the boil then cover and place in the preheated oven. Cook for 3 to 3 and ½ hours until the meat is tender. Test by pulling apart a piece of meat, it should be soft and stringy. Remove the bay leaves and thyme sprigs. Add the sliced mushrooms to the beef and stir through. Alternatively, you could transfer the meat into your slow cooker, cover and cook on low heat for 6 to 8 hours until the meat is tender. To make the mash. Boil the potatoes in a large pot of salted water until tender then drain very well. Bring the milk to the boil in a separate saucepan and add little by little while mashing the potatoes, using the original saucepan to mash them in. When smooth, add the cream, parmesan cheese, butter, salt, pepper and garlic to the potatoes and whip till smooth with a wooden spoon. 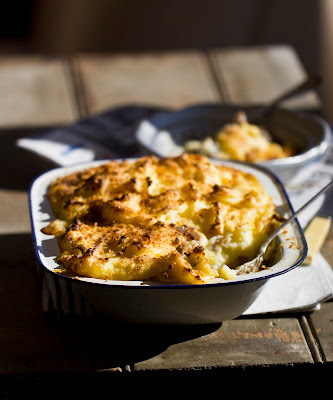 Spoon the mashed potatoes onto the prepared meat and sprinkle with breadcrumbs and dobs of butter. To finish the pie, preheat the oven to 180C. Cook for approximately 20 minutes until the filling is bubbling and the potato top is crunchy and golden. First published Canberra Times 25 July 2012. Having met some friends out for lunch recently, I craved something a little different to the usual menu suspects of wagyu burger, chicken burger, ceaser salad or trio of dips. Not feeling particularly hungry I ordered the soup of the day, artichoke, parsnip and pumpkin. While my friends are engrossed in conversation, I’m distracted by the menu choices and see that French toast and bacon with maple syrup has slipped into this menu too. This US style dish has crept into the menu vocabulary of many cafes and I wonder do many people order this? Back to the soup. The waiter appears with a bowl of, what resembles, a vegetable puree that has split and is slightly dried out on the surface, topped with a drizzle of olive oil. It didn’t look particularly appetising, but nevertheless I tried it. The taste was muddy and vegetal but oddly sharp, dominated by the vegetable stock base. When the waiter came to clear the table, he shrugged and said they had sold out earlier of the more popular Thai coconut and pumpkin soup and that this one wasn’t as nice, sorry. Making interesting soups is mostly just an experimentation of flavours, which is how I stumbled upon my earthy and fruity combo. I usually pick a vegetable and imagine it paired with other fruit, meat or vegetables for my combinations. The great thing with soup is the unintended nutritional perks of vitamins, minerals and fibre, all for just a couple of dollars. 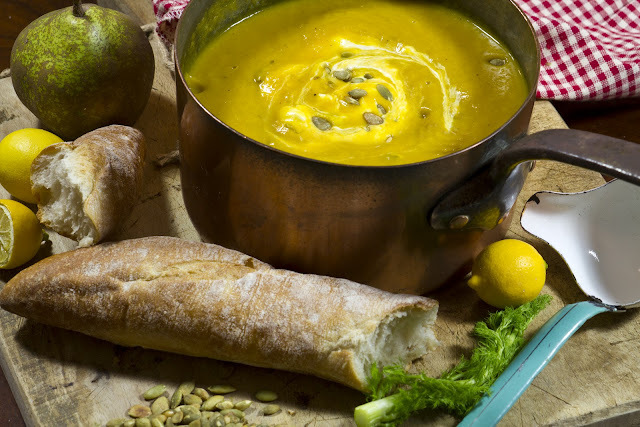 This pumpkin, pear and fennel potage is so easy to make that even someone devoid of any culinary nous could throw it together in less than 20 minutes. Don’t forget to add the squeeze of lemon juice after it is plated. This excites and lifts the flavours of the pumpkin, fennel and pear, leaving a lovely tang in your mouth, lifting it from the mundane to the extraordinary. The best way to serve this is with a lemon quarter for each bowl and some crunchy sourdough for dipping and mopping. Place the chopped pumpkin in a large mixing bowl and add 2 tablespoons of the olive oil, salt and pepper and toss to coat. Place onto the lined baking tray and place in the oven. Roast for about 30 to 40 minutes or until tender when pierced with a knife. Remove from the oven. Warm 2 tablespoons of the olive oil in a casserole pot over low heat and stir in the Spanish onion and shallot. Season lightly with salt and cook for 5 minutes. Add the fennel, celery, garlic and a pinch more salt and cook, stirring often, for another 5 to 10 minutes. Stir in the ginger, cumin, nutmeg and a few grinds of pepper, then add the roasted pumpkin. Pour in the stock, increase the heat, and bring to a boil, then reduce the heat so that the soup simmers gently. Add the pears and orange peel. Partially cover the pot and simmer for about 20 minutes, or until the pears and pumpkin are soft enough to be mashed with the back of a spoon. Puree the soup, in batches in a blender of a food processor. Taste for salt and pepper. If the soup is too thick for you, stir in a little more stock and reheat. Ladle the soup into individual bowls and finish with a little lemon juice. Serve with individual lemon wedges. Top with a dollop of sour cream and some roasted pumpkin seeds.